From Delaware Online: The Federal Energy Regulatory Commission approved the export of liquefied natural gas from Dominion Energy’s Cove Point facility on the Bay. Natural gas will likely begin to be exported from this location starting in 2017, and be carried via ships to Japan and India. Many environmentalists remain opposed to this plan, citing concerns over the extraction, processing and shipping of natural gas. From CBS Baltimore: Baltimore County has allocated $13 million to clean up White Marsh Run, a tributary of the Chesapeake Bay. Flooding and erosion result in frequent bursting of sewage pipes, sending sediment and waste downstream into the Bay. The funds will allow for construction crews to rebuild the stream and relocate the sewage pipes. From the Washington Post: Journalist Darryl Fears highlights the recent return of sturgeon, decline of rockfish, and the rise of the invasive water chestnut grass to the Bay and its tributaries. In a previous post I mentioned that I had started an oyster garden in early July. 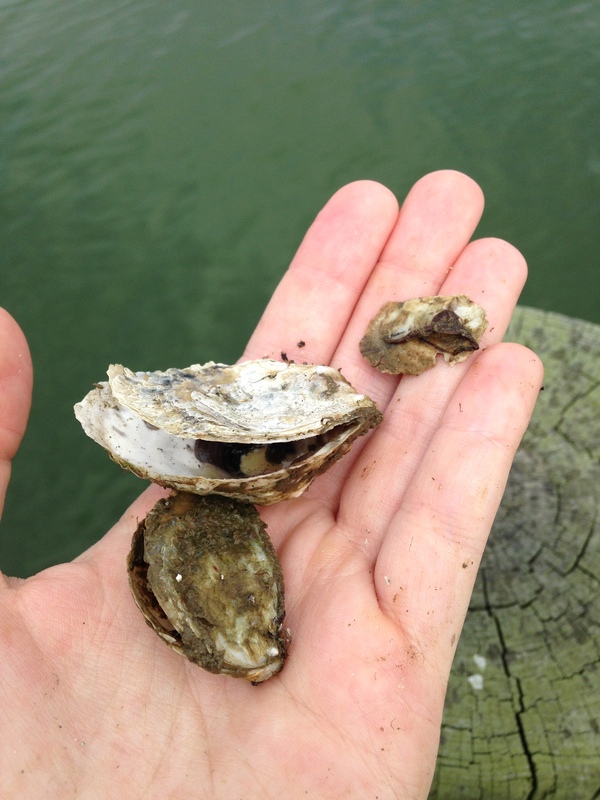 The oysters were purchased from a party that grows oysters from seed (from the hatchery) until the animals reach roughly the size of a quarter. I got a bag of 300 of these quarter-size oysters, and put them in a sealed mesh bag that I placed inside of an oyster float. In the two months since I started the garden, the oysters have grown about an inch. Some oysters are larger than others. 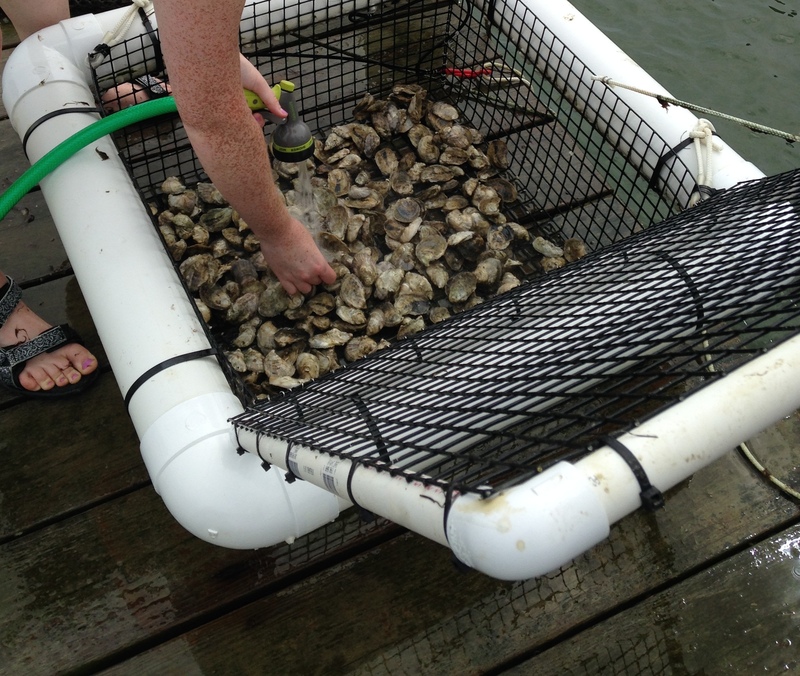 Because a few were still not big enough to be placed directly into the float, all of the oysters were kept in the mesh bag, where they will continue to grow for a few more weeks. When the float was brought up for cleaning most recently, there were three blue crabs that had to be removed. Blue crabs prey on the oysters and in fact, 14 from my batch had been pried open and left for dead, presumably by crabs (oysters pictured below). 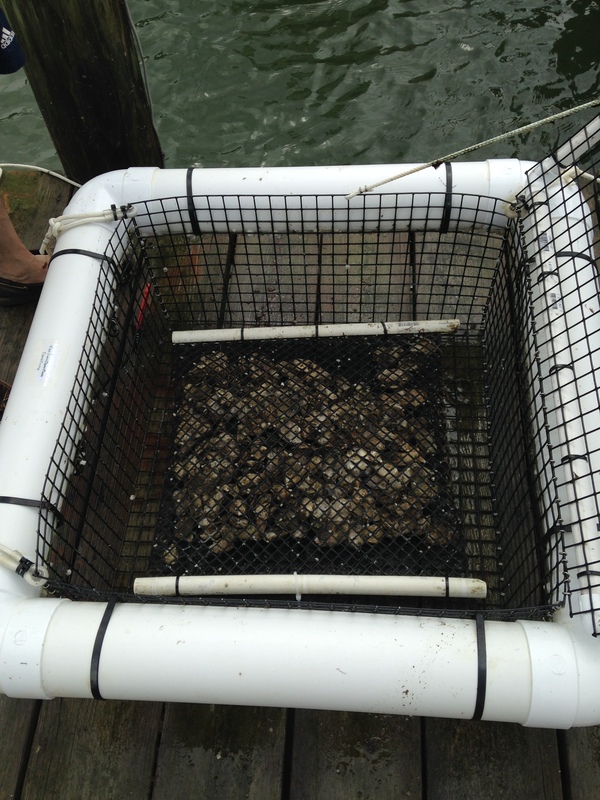 The oysters will go dormant and stop growing in the winter months, as the water temperatures fall. 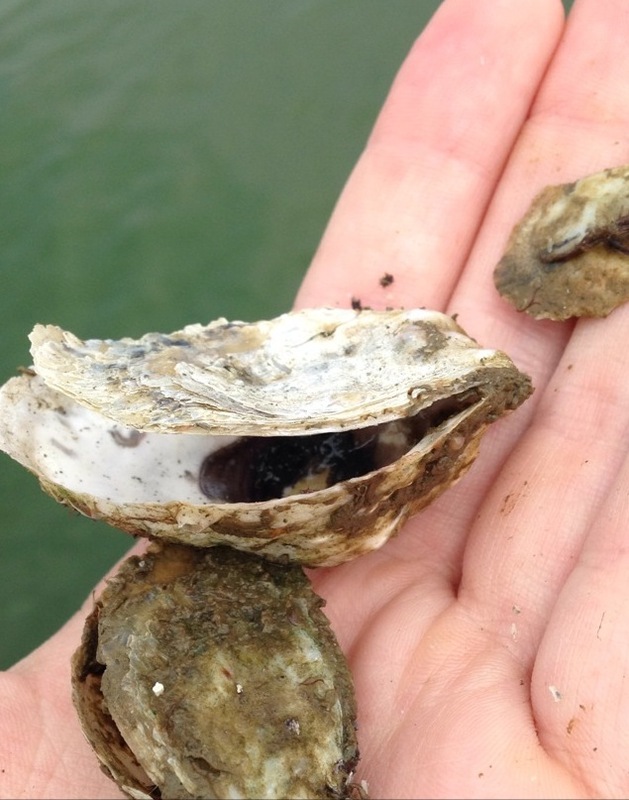 The oysters need to grow at least another inch- until they reach 3 inches- to be edible, likely around late next summer or early fall. For now, they are doing their part to filer water in the creek and improve water quality. This entry was posted in Oysters and tagged Oyster Garden. Spend a day on the Chesapeake Bay and you’ll see osprey all around- nesting on channel markers, diving for fish in the water, and flying above your head. These birds are common to the Chesapeake Bay, and live near bodies of water across the globe. Some 40 years ago, a sighting of an osprey in the Bay would have been much rarer. Osprey were endangered in North America throughout the 1940s, 50s and 60s with the widespread use of DDT as a pesticide. By 1975, species numbers had fallen by 90% on our continent. DDT was the cause for this decline, as it harmfully impacted osprey eggs; the birds were laying eggs that were not hatching, or had shells so thin that they broke during incubation. The use of DDT for agricultural purposes was eventually banned in 1972, and since the phaseout of DDT, osprey have had an incredibly successful comeback in North America. Although DDT is no longer a threat to osprey, there are a number of other chemicals and contaminants that humans use and dispose of that make their way into the osprey’s food chain. I read an article from Environmental Health News that discusses some of the other threats facing osprey today. The article, “Osprey whisperers: Deciphering decades of clues from the sea hawk,” talks about how osprey respond to contaminants they ingest. The author uses several examples of the effect of contaminants on osprey in different regions, including the discharge of prescription drugs into the Chesapeake Bay. Osprey, which eat fish, are at the top of their food chain. Pollutants found in the waters where osprey live bioaccumulate in the food chain, and can have serious impacts on these bird’s reproductive and migratory habits. The article points out that examining how osprey are affected by what they eat can be indicators for their health as well as human health. Often, what is damaging to these birds, can be damaging to humans, if ingested or exposed to certain chemicals at high enough levels. I encourage you to take a look at this article, which I’ve linked to above. I found this particular piece through a post on the New York Times Dot Earth blog, where the author looks at the many ways birds can warn us about the health of our surrounding environment (“Winged Warning: Heavy Metal Song Distortion“).